1) What is Quality Center? 2) What is the Difference between TestDirector and Quality Center? 3) What is starting version of QC? 4) What is latest version of QC or ALM? 5) Does Quality Center supports UNIX operating Environment? 6) Does Quality Center has Programming Interface like QTP? No, it doesn’t have Programming Interface. 7) What is the default database of Quality Center? SQL Server, but it also supports Oracle for creating tables for projects if we provide Oracle run-time. 8) Does Quality Center supports SQL? Yes, It has Command line interface, user can execute SQL statements to get projects status. 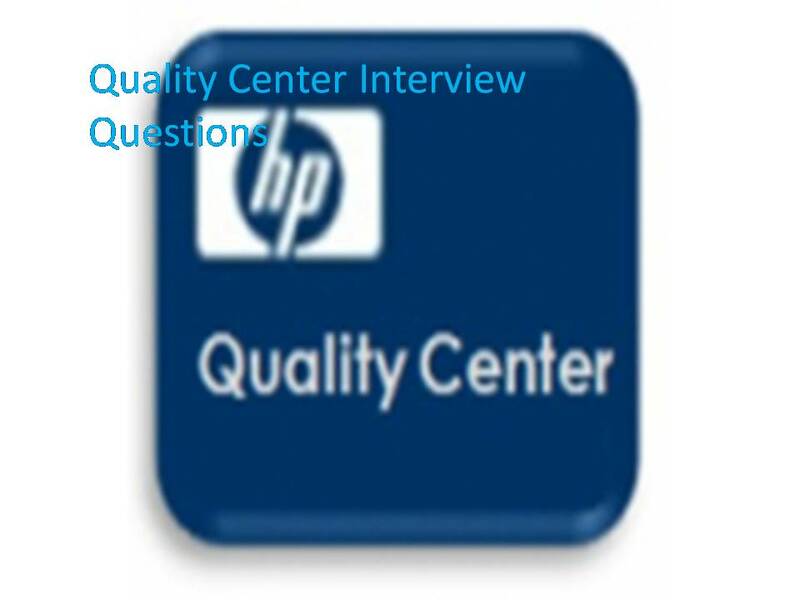 9) What HP testing tools does quality center integrate with? Quality Center integrates with Winrunner, QTP, LoadRunner and Visual API-XP. 10) How many modules are in Quality Center ? 11) What are the benefits and features of Quality Center ? Quality Center is a comprehensive test management tool. It is a web-based tool and supports high level of communication and association among various stakeholders (Business Analyst, Developers , Testers etc. ), driving a more effective and efficient global application-testing process. Automation Tools like QTP, WinRunner and LoadRunner can be integrated with Quality Center. One can also create reports and graphs for Analysis and Tracking for Test processes. 12) What is meant by Instance? 13) How to ensure that there is no duplication of bugs in Quality Center? 14) How to switch between two projects in Quality Center ? In QC 9.0 and above you can switch between two projects by select Tools>Change Projects>Select Project. In other version, you will need to log-off and log-in again. 15) What is Coverage status, what does it do? Coverage status is percentage of testing covered at a given time. Coverage status helps to keep track of project deadline. 16) How can we save the tests Executed in test lab? 17) Can you map the defects directly to the requirements (Not through the test cases) in the Quality Centre? • Run and report bugs from your test cases in the test lab module. The database structure in Quality Centre is mapping test cases to defects, only if you have created the bug from Application. test case may be we can update the mapping by using some code in the bug script module(from the customize project function), as per as i know, it is not possible to map defects directly to an requirements. 18) Can we upload test cases from an excel sheet into Quality Centre? 19) What is meant by test lab in Quality Centre? 20) How do you run reports from Quality Centre? 1. Open the Quality Centre project. 2. Displays the requirements modules. Analysis > reports > standard requirements report. 21) Can we export the file from Quality Centre to excel sheet. If yes then how? Requirement tab– Right click on main req/click on export/save as word, excel or other template. This would save all the child requirements. Test plan tab: Only individual test can be exported. no parent child export is possible. Select a test script, click on the design steps tab, right click anywhere on the open window. Click on export and save as. Test lab tab: Select a child group. Click on execution grid if it is not selected. Right click anywhere. Default save option is excel. But can be saved in documents and other formats. Select all or selected option. Defects Tab: Right click anywhere on the window, export all or selected defects and save excel sheet or document. 22) How many types of tabs are there in Quality Center and Explain them? 1. Requirement : To track the customer requirements. 2. Test plan: To design the test cases and to store the test scripts. 3. Test lab: To execute the test cases and track the results. 4. Defect: To log a defect and to track the logged defects. 23) When you run a test on remote host group is the test executed on all the hosts available in the group? It runs only on the first available host in the group. 24) What is a test sets tree in QC? Quality Center test sets tree design to achieve specific testing goals and organizes and displays the test sets hierarchically. 25) What does a live analyses graph display in QC? 26) Can u tell me the phases of Test management with Quality Center in order? The phases of Test management with Quality Center in order are: Specify Releases, Specify Requirements, Plan Tests, Execute Tests, Track Defects. 27) What the User group determines? The User group determines the privileges that the user has within a project. 28) Why to use filters? How you define filters? You can filter Quality Center data to display only those records that meet the criteria that you define. We can define Multiple items as filter. 29) Which filter can we define in test plan tree? What is the use of it? In the test plan tree, we can define the Cross filter for associated test sets as”Open”.This ensures that only tests that belong to an open test set are displayed. 30) How records appear in QC? By default records appear in Quality Center in the Order in which they were added. 31) What are the 2 interfaces of Quality Center? 32) What are the Important features of Site Admin?